Whether you are leveraging the cloud for software as a service (SaaS), infrastructure as a service (IaaS), or platform as a service (PaaS), cloud security is a mandatory cost of doing business. 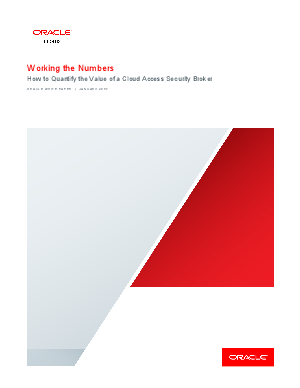 In June 2016, Gartner issued a press release identifying the top information security technologies and included cloud access security brokers (CASBs) at the top of that list. Protecting your data and IP in the cloud is not an option. Knowing that an ROI for a CASB could be longer term, how do you quickly quantify the additional value a CASB provides so that it gets a high priority in your already stretched information security budget? This white paper helps you to build a business case by walking you through the cost considerations and payback of a CASB. It demonstrates that a CASB provides stronger cloud protection at a lower cost than traditional security processes and tools.